Morley College is running a series of courses linked to the new David Bomberg exhibition at the Borough Road Gallery, so I thought it would be a good chance to get back into the feel of the novel. The novel that will one day be written, but written when it will be written, at its own pace. After seven years of working on the Mark Gertler novel, I’m still not ready to embark on another huge writing project. But I want to stay connected to Bomberg. I feel his presence in my life. Monday’s Morley course was about the urban landscape, which I’m kind of obsessed with at the moment, so it was nice to go somewhere to be introduced to new ideas and be in a painting environment, which puts me into beginner mode/beginner mind in a way that excites me. I don’t expect to be able to paint; I still do it with my fingers, primarily. 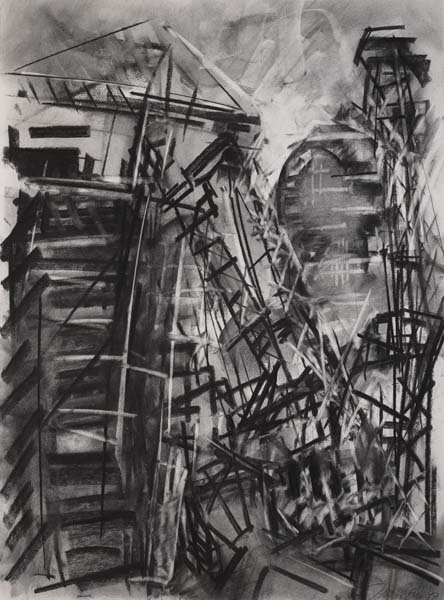 But being with painters and visual artists and being given license to sit opposite the demolition site near the Old Vic and sketch/take notes/do research is liberating and makes me feel closer to Bomberg, to the way he might have engaged with the world around him, especially during and after the Second World War when London was pretty much a demolition site. Granted, the Travelodge doesn’t have a mini-bar, though it does have an all-night menu, and one (sometimes even two) unwrapped bars of soap, and in the case of the one I stayed in this week, a room on the seventh floor looking down onto spectacular views and the soothing ta-ta-tum, ta-ta-tum of trains pulling out of and into London Bridge station. From the window of that seventh-floor room, London was there! The dome of St Paul’s, the new flats rising up around Tate Modern, a Holiday Inn Express, its lime-green sign a dab of colour in a monochrome cityscape. And the trains keep going back and forth, a soothing heartbeat sound, and the pressing of steel against steel, wheel against track, a metallic straining. First Capital Connect to… Brighton? The train’s bright yellow front, like the face of a caterpillar on a blue and indigo body. The buildings are a conglomeration, a mess. There is only disorder, straight lines, the occasional tree or bush growing – flourishing! – on a roof garden or a balcony open to the sky. And I struggle to find ways to spell the sound of a train. When we get to the demolition site there is a wall of mirror windows behind it, like the grid of an early Bomberg painting, like Ju-Jitsu, perhaps. And then, of course, it starts to rain, a light drizzle, like sea spray, and the rain turns the ink on the page to a watercolour. And the digger’s keep churning up the rubble, their engines nmnmnhnmhnmn-ing, hungry to be fed. Which brings us to lunch in the Morley College canteen, and the repetition of sweetcorn kernels and the beans in a sausage-and-bean hotpot. 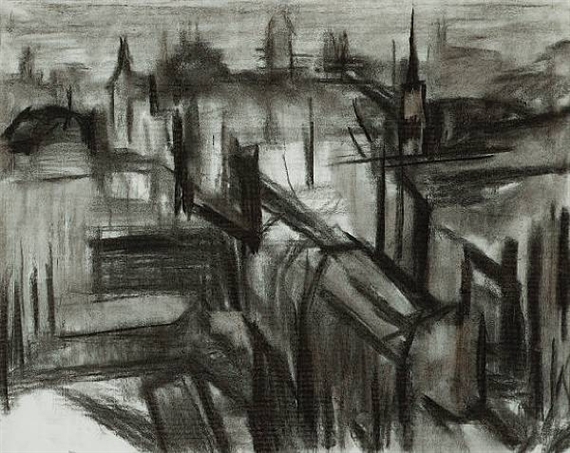 And while I eat I think about Bomberg and how, for his entire life as a painter, he went looking for the singular landscape, a landscape without repetition. A mountain, a river, a hill. Full of light. The perfect light. Away from the incessant humming that repetition creates, the same thing over and over, pavement slabs, traffic lights, cars, road markings. Even the weather was a form of repetition: wet and grey. By the end, he would do anything to avoid that, the straight lines of the city, its sky the colour of rubble. The city is a series of repetitions, samenesses, buses, windows, coffee chains, and every once in a while there is something singular, a one-off, which is part of why I love The Shard, but that’s another story. The Shard gives me hope that there is room in this world for the singular apparition, the freak that stands out, the knife-edge rising up from the ground, magnified, slicing through the earth – like the sword that parted the egg to gave birth to Eros – and making the city the glorious place it is. I like the sketches, Shaun! 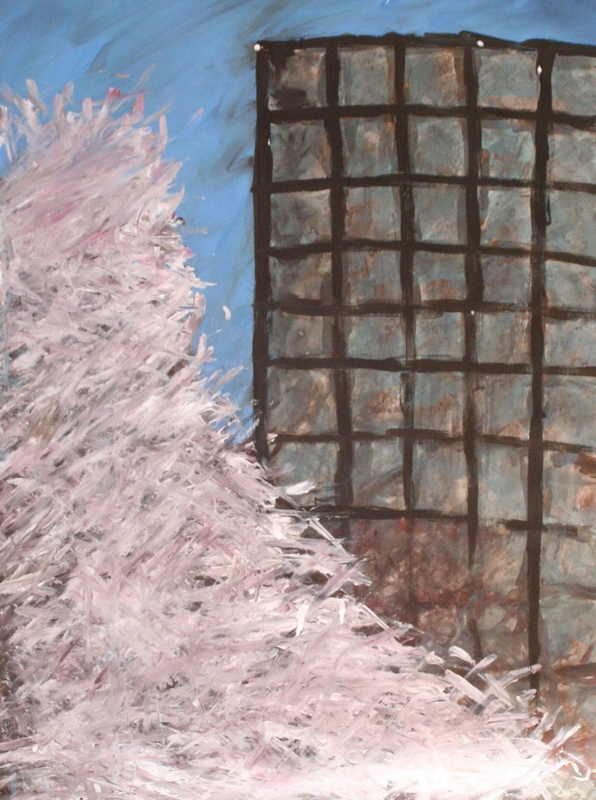 Especially the energy in the second one, crammed into the frame – real big city feel. And the big whitish blurry shape of dancing dashes in the third one.